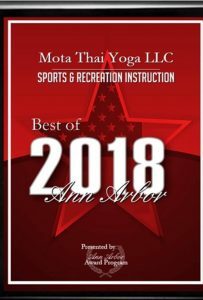 Mota Thai Yoga is happy to announced that it was just awarded Best of Ann Arbor 2018 in the category of Sports and Recreation Instruction. Luiz Mota has been a tenant here since 2013 and we are extremely proud of how he has grown his business over the last 5 years. Luiz has an extensive background in yoga and martial arts. At age 6 Luiz began learning and competing in martial arts. In his teens he began training others to compete. This piqued his interest and began his understanding of working with people who had injuries. As an adult Luiz began investigating other interests which led him to enroll into a mortuary science school where he was introduced to a deeper understanding of the anatomy of the human body. Although interesting he soon realized his true passion and returned to his study of yoga and martial arts. Luiz took his extensive knowledge of anatomy to his yoga practice and this helped shape his classes and teachings. Luiz infuses his classes with multiple disciplines. Classes are based in Hatha and inspired by Vinyasa, Iyengar, Anusara and Kundalini. After years of studying martial arts and different styles of yoga across the country he has taken what he has learned and developed a way to safely access the muscular and neuromuscular systems of the body to help clients achieve their goals. His diverse classes combine Yoga, Ballet, Pilates, and Martial Arts to increase neuromuscular efficiency, body posture, balance, strength, and power. His is registered with Yoga Alliance as a E-RYT 200 yoga teacher.